I'm really pleased with this picture, for a few reasons. First, it was taken during a rare weekend that my wife and I could get away to Montreal without the wee guy in tow. 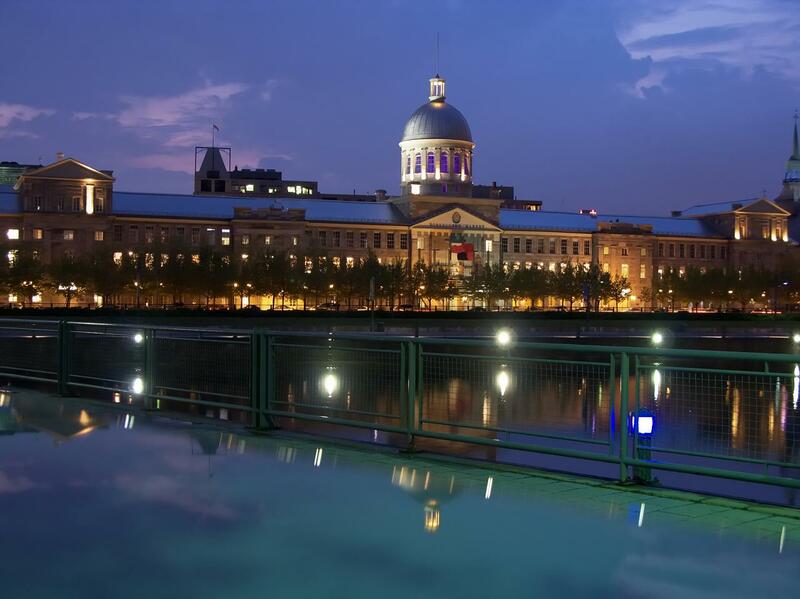 We both love the architecture in Vieux Montréal and are happy to spend hours walking around, visiting museums and galleries, and trying out new places to eat. I took this shot after we'd been out for a terrific meal in a restaurant that features live jazz (and tasty dead meat). Second, I think it's a beautiful image. I haven't done a lot of night photography and this was largely the product of chance. It had rained earlier in the evening, leaving the streets wet and the sky cloudy. So far, so good. I didn't have a tripod with me, however, so I needed somewhere stable to sit the camera that would be above the level of the fence in the foreground. As luck would have it, there was a metal service box at just the right height. As even better luck would have it, the top of the box was also wet and giving off vivid reflections of the night sky. Finally, this was the first weekend with my new toy, a Canon G9. I'd been reading about this high-end point-and-shot for a while and thought that it might be just the thing for those times when I don't feel like dragging around a backpack containing my Nikon D70s and lenses. I love my D70s, but the G9 is a little dream. Yes, it's as noisy as heck much above ISO 200 to 400, but I'll leave it set at ISO 80 as much as possible and will learn to work with the noise when I have to (when life gives you lemons, you make lemonade, etc.). I'm extremely impressed with the quality of the 12.1 MP RAW images, the accuracy of the metering, the choice of shooting modes, the zoom range, and the sheer convenience of toting around such a capable little package on a belt loop. It's a definite keeper: a picture's worth a thousand words.